1. I’ve been hoping Rag & Bone would come out with a new color in my favorite Newbury boot and they finally did! I’m loving this subtle neutral stone shade they just added to their fall lineup. 3. 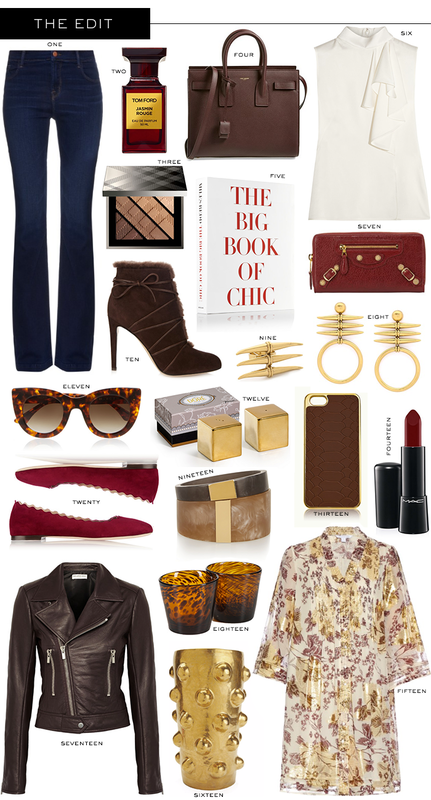 As always, bordeaux/crimson/oxblood is a major color in accessories for fall. I’m particularly loving those handbags featuring silver hardware, like this Proenza Schouler bag and this Prada tote. I feel like the silver adds a little something different – maybe it makes the bag look a little more edgy? I’m not sure, but I like it. 4. To be honest, I never get too fired up about Diane Von Furstenberg’s pieces. This dress has me changing my tune though. Such a fun print and fab option for a cocktail party! 5. If you love hats, you gotta check out this one by Rag & Bone. It’s black with brown leather trim, making it the most versatile accessory in your closet this season! great picks love the hearthy tones. LOVE everything about these pieces – makes me crave fall! You are going to have so much fun dressing for fall temps. Obsessed with this color way! Love the white blouse pick! I always say sumer clothes are my favorite, but then fall comes around and I say fall clothes are my favorite! Love the earthy tones that come with fall. Those scalloped flats have been on my wish list for a long time! Any color, I just love! Is it crazy that I’m actually looking forward to fall? Love your picks!